As you can see, notwithstanding the impressive size of this dressing room, it smartly and conveniently contains much more. In order to create enriched visibility, a large mirror was installed in the centre providing not only functionality but also the illusion of doubling the size of the space, and creating a more open atmosphere. The entire house is decorated with parquet flooring and the entrance to the dressing room is continued the same vein providing a warm and comfortable feeling even in the cold winter days. In general, parquet flooring in a walk-in dressing room adds elegance and comfort. 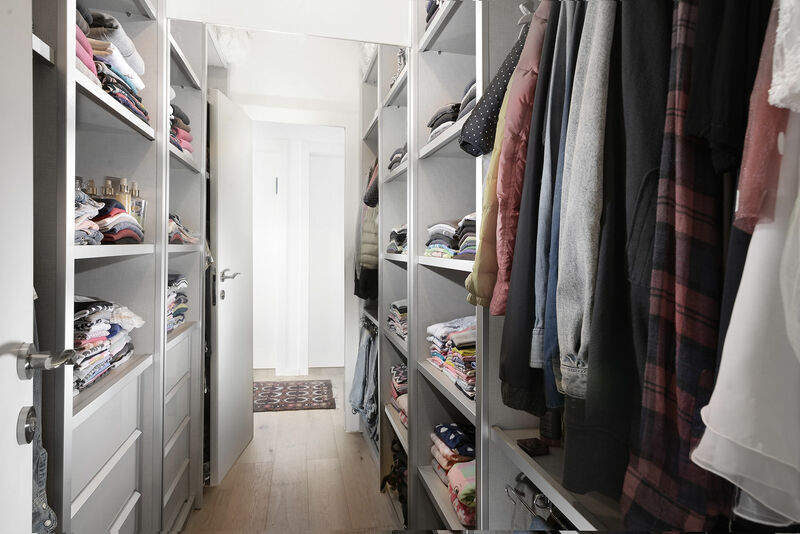 The dressing room contains hanging space for coats and winter clothing, together with drawers and shelves for perfumes bottles, shirts and trousers for everyday use, even though there is another wardrobe in the bedroom for more frequent use.